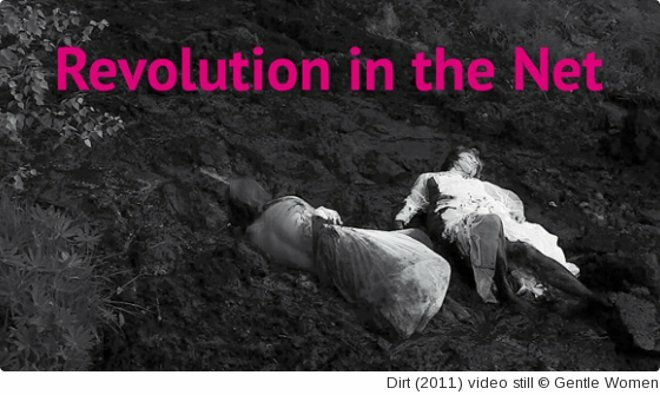 News : 'Revolution in the Net' Exhibition: Olga Zhitlina, Factory of Found Clothes, Gentle Women, HIAP Galleria, 8.11.-2.12. 'Revolution in the Net' Exhibition: Olga Zhitlina, Factory of Found Clothes, Gentle Women, HIAP Galleria, 8.11.-2.12. The exhibition Revolution in the Net deals with social and political conditions in contemporary Russia, focusing on the political events surrounding the presidential election in spring 2012. It includes works by Russian artists and artist collectives: Olga Zhitlina; Factory of Found Clothes (FFC) represented by Natalya Pershina Yakimanskaya (Gluklya); and the collective Gentle Women (Nezhnue Babu, Evgenia Lapteva and Alexandra Artamonova). The exhibition is curated by St Petersburg-based curator Anna Bitkina (upcoming resident at HIAP 19.11.2012 — 16.12.2012).